Do you see a fundamental technical problem in Andy's serve? What is "wrong" with Andy Murray's serve? He can hit his first serve 135mph, is serving over 60%, and wins about 75% of his first serve points. But that big flat first serve doesn't seem reliable at critical moments. Then there is his second serve. He is averaging around 85mph, slower than some of the women, and winning only around 50% of his second serve points. Is it mental? Over time Andy has proven to be one of the best mental fighters in the modern game. Is it his unbalanced landing with the left arm flailing back behind him? Andy Roddick had a similar landing, bending over substantially at the waist and throwing his left arm behind him as far or farther than Andy. High speed video shows there is a fundamental flaw in the motion. The problem is almost impossible to see with the naked eye and is not recognized by coaches or commentators, including those who are former players. The problem is Andy's rotation of the upper arm, hand, and racket in the swing--or rather his lack of it. In a high performance serve--or a good serve at any level--this rotation begins with the upward swing and extends out into the followthrough. First serve: Roger's racket turns over 180 degrees in the upward swing, but Andy's is half that. When the internal arm rotation is complete, the racket face turns over 180 degrees or more from the racket drop to the extension of the motion in the followthrough. Roger Federer is a great example. Watch how his racket continues to turn through the contact. At the completion of the rotation the plane of the racket face is perpendicular to the court. Andy's rotation is only around half that. The face of his racket rarely rotates past parallel with the court. As the racket comes up, both players start to square the racket head to the ball. But notice how Federer's racket continues to rotate until it is inverted, with the top edge pointing down to the court. Andy's racket basically stops rotating at the contact with the face still pointing downward. The issue is exactly the same for the second serve. Watch the same difference in the rotation and the angle of the racket head at the extension of the forward swing. Watch the same difference in the hand, arm, and racket rotation on the second serve. The difference isn't aesthetic. This lack of rotation is causing Andy to lose significant spin. On his second serve he is also losing substantial ball speed. How much? On his first serve Andy is averaging about 1900rpms. Compare that to Roger Federer at 2400rpm. That's 20% less. Andy's second serve is spinning at about 4000rpm. Federer's averages about 4800rpm. Again Andy's spin level is 20% lower. His second serve ball speed is also 10 to 15mph slower. Those are major differences. So why the huge technical difference in the swings? That is a question for Andy. I suspect it goes back to how he was originally taught to serve and possibly an emphasis on "snapping" the wrist. Watch how Andy's wrist tends to deviate to his right as the motion moves through and past the contact, what is called ulnar deviation in biomechanics . Yes, you do see some left to right wrist movement at times from Federer and other players--probably the consequence of serve location and or the amount of sidespin. Watch Andy's wrist deviate from left to right. Is he trying to "snap"? But this flex toward the outside in Andy's motion looks mechanical and somewhat forced on many balls. Worse, it stops the most important driver in the swing--the upper arm, hand and racket rotation. I have seen the huge positive effect of learning to complete this critical rotation with players at all levels. 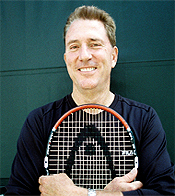 Players learn to model the path and position of the racket head physically and then create a corresponding mental image. By visualizing the image and the feeling associated with the motion, players quickly learn the full rotation. It would be fascinating to see Andy work with this position and image. Some coaches refer to this rotation as "pronation." That is biomechanically incorrect, as pronation refers only to the independent rotation of the forearm. But if the term works as a teaching concept there is nothing wrong with using it. The point is to get the player to fully utilize the elements in the biomechanical chain, especially one that is a majority contributor to racket speed. It says a lot about our fundamental level of understanding of the game that a Grand Slam champion could have that kind of flaw, have it go unnoticed not only by his team, and by the so-called media experts. But you can't analyze what you don't understand right? At contact, Federer's ball position is further to his left and more inside the hitting hand. Beyond the lack of rotation in his hitting arm, there is another element in Andy's serve that is very likely contributing to the loss of spin. This is the position of the ball at contact. This is related obviously to the tilt of the racket. As we have seen in previous articles, most elite serves make contact with the ball well inside or to the left of their hitting hand, with the racket tip tilted or angled to the player's left. If the ball is too far to the right, the tip of the racket is naturally more upright at contact. This restricts the ability to generate topspin. This left ball position and the corresponding racket tilt is increased for the second serve compared to the first. The angle of the racket face at contact determines the amount or percentage of topspin. More angle to the left, more upward motion to contact, more topspin. If we look at Andy's contact points, we see that, on his first serve, his racket tip is almost directly straight up and down. That means the racket isn't rising, or is barely rising at contact. The racket is moving from left to right and that generates the sidespin component. But without the upward motion, the topspin component is significantly reduced. In the animation, compare the angle of Andy's racket with Roger's. You can estimate the amount of topspin from the tilt. On the second serve, Andy's ball position is further left than on his first serve, but still significantly more to the right than Federer. On his second serve, we can see that Andy's racket face angle is beveled more to the left compared to his first serve. So there is definitely more topspin on his second serve. But again compare this to Federer. Federer's tilt is much more severe and the corresponding topspin component is higher. In fact, the tilt of Andy's racket on his second serve is roughly the same as the first serve for Federer. The solution here for any player with this problem is simply to toss the ball slightly more to the left, or more precisely, change the arc of the toss so that moves more sharply to the left sooner. If I had the chance to go on the court with Andy, I would suggest to him that he work on the hand and arm rotation first. Create an image of the fully rotated position, visualize it and make the actual motion pass through the imaginary blueprint. Now experiment with moving that ball position to the left. Those two adjustments would make his first serve heavier for sure, and maybe faster. Greater speed and spin could also turn his second serve from a liability into a potential weapon. Doesn't mean that is ever going to happen, but who knows where and how Tennisplayer information can travel.